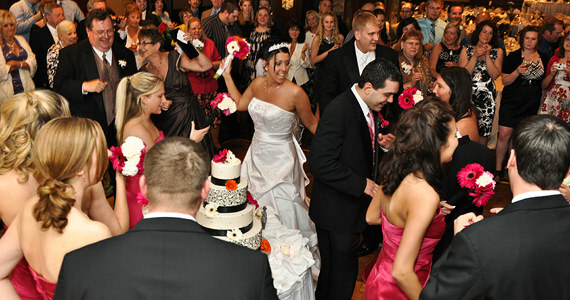 On Saturday May 08th 2010 we were at the Sheraton Inn Station Square in Pittsburgh Pennsylvania. The event was a wedding reception for Keith and Rebecca Arnold. Keith and Rebecca were married at 4:00 pm at St. Paul’s Cathedral in Oakland PA. Guests began arriving at the Sheraton Inn Station Square at 6:00 pm where they enjoyed cocktails and appetizers. At 6:45 pm we invited all of the guests to surround the dance floor in the Reflection Ballroom, as we formally introduced the bridal party into the hall. After the introductions, Keith and Rebecca cut their wedding cake to “How Sweet It Is” by James Taylor. They then shared in their first dance together as husband and wife to the song “History In The Making” by Darius Rucker. Next, the guests were seated in the Admiral Ballroom where they were welcomed by the father of the bride Mr. James Zielinski in a heartfelt speech. Toasts were offered by the best man Tim Fleegle and maid of honor Jackie Myers. Dinner was prepared by the culinary staff at the Sheraton Inn and was served sit-down style. After dinner, Keith and Rebecca played the Newlywed Game and then shared in a dance with the bridal party to “Friends” by Michael W. Smith. Rebecca then requested a special dance with her father Mr James Zielinski to “Butterfly Kisses” by Bob Carlisle and Keith danced with his mother to “On This Day” by Christian Barnes. 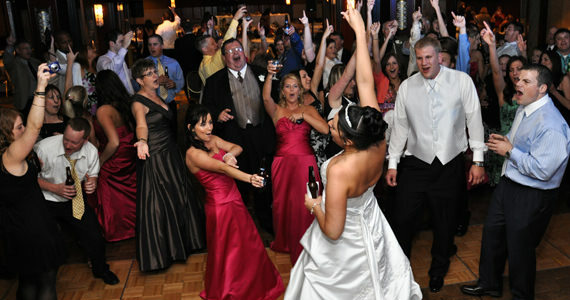 Throughout the remainder of the evening, guests danced to music by Kesha, Pitbull, Bon Jovi, and more. At 11:00 pm we invited all of the guests to share in the last dance of the evening to “Somewhere Over The Rainbow” by Israel Kamakawiwo’ole.